6. 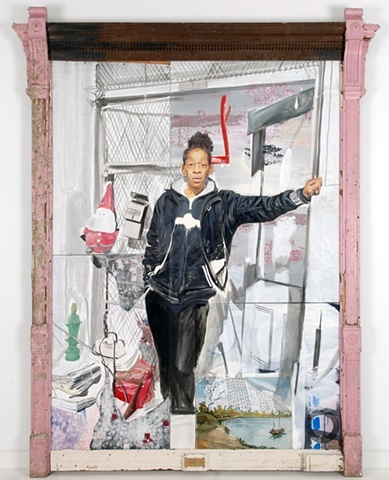 Later in the project it appeared as if each individual work over time -and without my conscious knowing- began to model itself(by symbol, icon, and archetypal characteristics) after various African deities(Oresha), their corresponding European Saints, along with an assortment of other mythological figures. The same ones already believed by living residents to have a constant presents in the building. Practitioners and believers in these supernatural figures would call or evoke them at times to intervene directly on their behalf in their lives here on earth. A means to seeing their will made manifest. Their prayers answered. The people I have painted have lived hard lives and must deal with realities and stand trials most never have to. They deal on an intimate level with drug addiction, prostitution, gangs, AIDS, and poverty. What binds them together is they all live their lives in close proximity to death. I found this proximity gave them a unique perspective on life.